I was lucky enough to make a trip to Nashville this past weekend to not only take in the city but also attend a Nashville Predators game. I came away from the trip with a great appreciation for Nashville and a new perspective on how things are done differently in arenas not named First Niagara Center. As someone who has a general concern for the atmosphere at Sabres games I wasn’t expecting to come away with so many different opinions on the stark differences between what the Sabres and Preds do. But that’s exactly what happened after taking in Sunday’s game between the Preds and the Caps. To provide some background, I’ve taken in hockey games in five NHL arenas – FNC, Air Canada Center, CONSOL Energy Center, Mellon Arena and Rogers Arena – prior to this weekend. Two were in work mode and viewed from the press box while another trip (CONSOL) was for sparsely attended college games. So I do not hold any sort of encyclopedic knowledge of the arenas with the best and worst atmosphere around the league. My overall impression of Bridgestone Arena was glowing. It’s a great looking building that is cool and modern inside. The prices for some of their concessions are higher than I’ve grown accustomed to here in Buffalo but that didn’t bother me much. One very interesting feature is that the press box is not separated from the fans. In fact, the TV booths are completely open-air and the press room is right off the main 300 level concourse. That means that NHL officials, scouts, media members, team management and scratches all mill about amongst the unwashed masses in their jersey fouls – and boy were there ever jersey fouls in Smashville. It actually makes for a very interesting atmosphere in that corner of the arena during intermission. I just about ran headfirst into David Poile and both Poile and Seth Jones were chatting with fans at various points in the evening. It’s unique and I give credit to the fans who know well enough to respect that those guys are working and not hounding anyone for autographs. If that’s an unspoken rule in Nashville, I wasn’t aware of it. We were lucky enough to catch a very entertaining game as the Preds took a 4-3 shootout win from the Caps. The teams traded goals, there was a vigorous fight and plenty of energy all around. The game presentation stood out to me almost immediately for the way the fans were engaged and the focus that was placed on the game at every turn. What stood was that the Preds used very little time between whistles for any sort of promotion. And the promotions that were run often engaged the crowd. There were minimal shots of fans on the video board unless the person being shown was already doing something. Comparing this to the Sabres games I’ve attended recently (including last night’s) in which fans are shown at nearly every whistle in various states or boredom or Tinder swiping and the contrast is stark. Time between the whistles in Bridgestone is saved almost exclusively for replays of what just happened using every camera angle available, but also game-related information. At no point was there a wasted moment and any crowd shots were limited. For example, on a TV timeout a hit compilation ran that culminated in a mash-up of body checks from the current game. It served as a segue into a pump up song prior to the faceoff. On the off chance that a quick whistle occurred or nothing noteworthy happened prior to a stoppage, the team used a combination of a movie clip, pump up song and a “make some noise” graphic to span the time between the play. I will say that by the third period the Preds were running out of useful movie or TV clips and the combination with the make some noise graphics was tiring. For what it’s worth the fans seemed to love it and were noisy leading up to every draw. 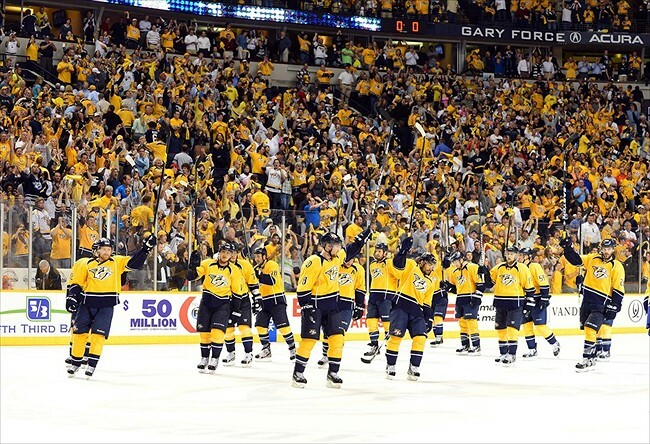 In a way that’s something that the Sabres can’t duplicate as it’s my opinion that a great many fans aren’t willing to join into the type of raucous atmosphere that the fans in Nashville help to create. That being said, Tuesday night’s Sabres games featured one of the best crowds I’ve been part of in quite some time. Organic, arena-wide chants began and the spontaneous Lieuu-ing and cheering was a welcome change to the typically subdued mausoleum at One SHK III Plaza. There are two things that I drew an immediate correlation to in Nashville in terms of building that atmosphere, outside of an excited, willing fan base. The first was the use of high-energy music that was, at times, paired with a noise meter graphic that got fans up and cheering. The other was that they didn’t waste a single second, even during TV timeouts with dull sponsored segments. All of that was saved for intermission. This includes things like a smile cam, the ever popular kiss cam and other features that do nothing other than direct fans’ eyes to the video board. These are all things done in Buffalo but they’re done during the period as opposed to between them, I think the reaction to those features in the two buildings says a lot about the atmosphere being created. As I stated earlier, everything that occurred during whistles during the period was designed to gear your attention and energy to the game unfolding in front of you. It was incredibly impressive and the way the fans embraced it made for an incredibly entertaining night. I don’t fancy myself as an expert in game presentation by any stretch. I feel confident in saying that I know enough that what I witnessed in Nashville stood out in stark contrast to what has been done in Buffalo. One thing that I’ve consistently preached about is the attitude of Buffalo fans contributing to the atmosphere in the arena. Sometimes I think they’re too good to stand up and cheer for their team as if they’re above the practice. Other times I think they expect the moon and the stars from their team before they’ll put their heart into cheering. It’s hard to say, but as bad as it is to sit through the Aspen Dental Smile Cam, the fans hold a share in building a better atmosphere in Buffalo. The cool thing is, at least from my point of view, is that the Sabres can make a few simple changes to get closer to the party atmosphere they have in Nashville. Trashing their copy of Adele’s Greatest Hits might be a nice way to get started. The opportunity to catch a game in Nashville was a great way to cap a fun weekend. I didn’t expect to come away with the opinion I did, but it was certainly an eye opening experience. At the end of that day I think putting more focus on the game and less focus on selling every spare moment goes a long way in creating an engaging atmosphere. Glad you enjoyed your trip to Nashville – one joke that my son & I always have at games is that the hit compilation video you referred to (“Collisions of the Game” as the segment is called) actually features the same shots night after night, which are drawn from who knows how long ago. I noticed that there were a few throwbacks in there. But I don’t mind that stuff, especially because it keeps the focus on the team/game. It was better than some of the stuff the Sabres do between whistles.